Welcome to New Hamburg Office Pro ! New Hamburg Office Pro has been providing outstanding service, a wide range of Office Supplies, Furniture & Stationery to our customers since 1975. We are small enough to offer “hands on” personal service to our Small Business and Residential Clients and big enough to meet the business requirements of our Corporate Accounts. At New Hamburg Office Pro we recognize the importance of providing our customers with a "one-stop" shopping environment for all your business needs. Our Staff have collectively over 50 years of experience in the Office Supply industry. Our employees guarantee courteous and friendly service, if we don’t have what you are looking for, we’ll do our very best to find it for you! As a member/owner of one of Canada's largest office products buying groups, New Hamburg Office Pro is able to offer competitive pricing, selection and availability. With a warehouse capacity of over 60,000 square feet and a product offering of over 15,000 skus we proudly boast a 98.7% fill rate. You can save money on 100's of our “OP” private branded products made exclusively for us by many of the highest quality North American Manufactures. 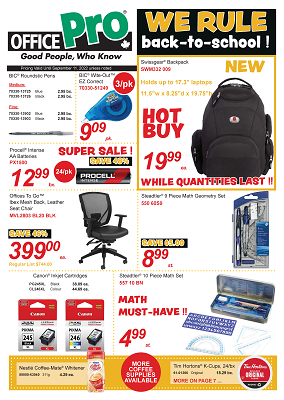 Don't forget to check out our current flyer and featured products for great deals to save you money! If you have New Hamburg Office Pro’s Catalogue, simply give us a call with the product number and we can process your order right away. No catalogue on hand? No problem, call to request this year's latest catalogue. One will be dropped off to you by one of our experienced and friendly sales associates. With a fill rate of over 98% you can feel confident that any office supply order placed before 3:00 p.m. will be delivered the next business day.